Okay, so this isn't REALLY a fondue...it's just a broth cooked in a fondue pot, kept simmering for you to literally cook things in it. A fun idea, but boy does it take forever to eat this as a meal. The broth is a combination of vegetable stock, lemongrass (wow, this stuff is amazing), fresh ginger, garlic, shallots, and lime juice. As you can probably imagine, wonderful aromas--sour, fragrant, sweet, pungent, herbal--will come from your kitchen as this cooks. I actually cooked this on the stove first, before transferring it to the fondue pot. The dipping sauce (yes, there is also a dipping sauce) consists of soy sauce, lime juice, garlic, red pepper flakes, and fresh basil. Make sure you use low-sodium soy sauce as the recipe suggests: I did not, and the stuff was almost too salty to eat! 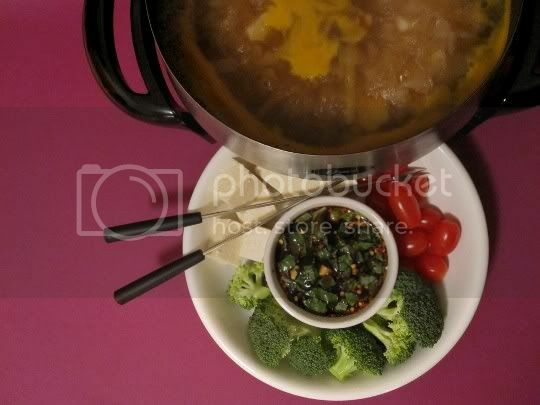 For dippers, I used broccoli spears, grape tomatoes, and cubed extra-firm tofu. Now although the idea is to cook the dippers one at a time, the broth is hot enough that they do cook QUICKLY. So I would take one fondue fork and spear a dipper, and leave it in the broth while I ate another one, and so on and so forth. The switch in and switch out seemed to work well for constant noshing. I did try eating the cooked dippers fresh out of the broth without the sauce, but the sauce (though salty as it was) did add a nice extra flavor of tanginess and sweetness from the basil. Once the dippers were cooked, I did as the recipe suggested and turned the broth into a soup by adding thin rice noodles. This made for a satisfying and tasty meal the next day--tangy and tart, super fragant, and savory--and at least all that delicious broth didn't go to waste! Make again? I suppose...with more dipper options and a LOW-SODIUM soy sauce.